2.500" (63.50mm) Long x 0.250" (6.30mm) Wide x 0.250" (6.30mm) thick, N40 Rare Earth Neodymium Rectangle Magnet, Magnetized thru thickness. Nickel Plated. About Large Rectangle Magnets: Defined with a length equal to or greater than 1.000” (25.40mm). 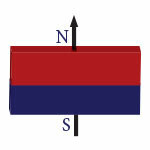 The surface area will determine the reach and profile of the magnetic field and performance of the rectangle magnets.